Things I like about Sydney No. 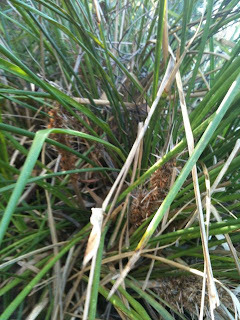 19: the edible plants of the Gadyan Track. He's now stuck in Amsterdam for another ten days or so before being allowed to come home by the powers that know about ash - which delay got me thinking: what if the other volcano blows? What if this becomes a permanent situation? What if we all have to stay put where we are now for ever? What if this heralds the end of inter-continental communication? What if Australia drifts off into perpetual isolation? There will be no more Marmite!!!!!!!!!!!! No no no no no! No foreign muck any more. Nothing but authentic Australian tucker from now on. There'll be kangaroo steak nightly, relieved only by the appearance of a bit of beer-battered barramundi on Fridays. I'll be having Vegemite on my damper for lunch with a can of VB as my amber fluid. I'll be having snags on endless barbies, yabbies, muddies and a couple of lobbies with some coldies, sammies to go with some billy tea in my can, lammingtons, tim tams, pavlovas and chokkies for afters. Oh, it'll be one long party! And you're not invited. Because you're over THERE, in Europe, for ever and ever, Amen. 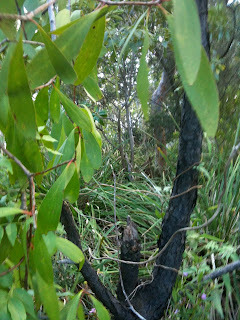 Only today however I learned that there are many delicious things out there in the bush that we can begin to eat, if only we listen to the wisdom of our elders and betters, the Cammeraygal. Firstly, a geebung. Brilliant name. 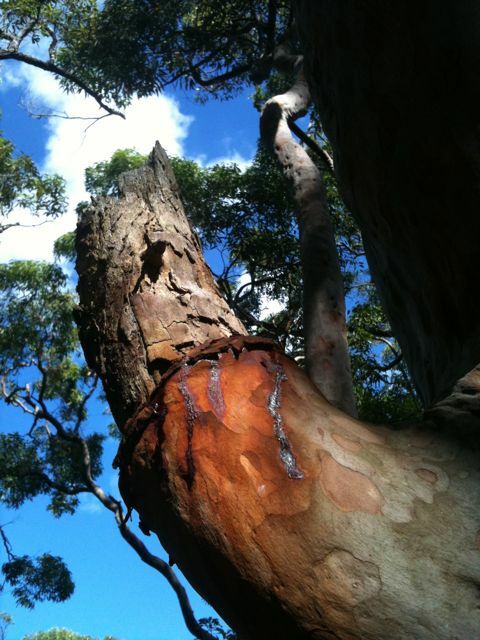 A geebung. 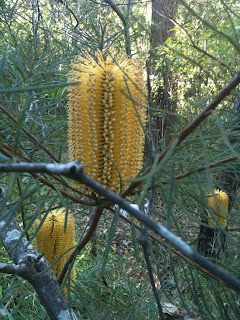 This particular edible geebung is called Persoonia Levis. The edible part is apparently its small green fruit but as a) there was no fruit and b) I wasn't entirely sure this was the right plant I haven't tried it yet. The description says it has broad bright green leaves (check) and black flaky bark (check) and that you can eat the fruit raw. So when I see it fruiting I shall give it a go...I'm thinking Geebung Marmalade or perhaps a Geebung paste to liven up the godawful cheese that passes as cheddar over here. 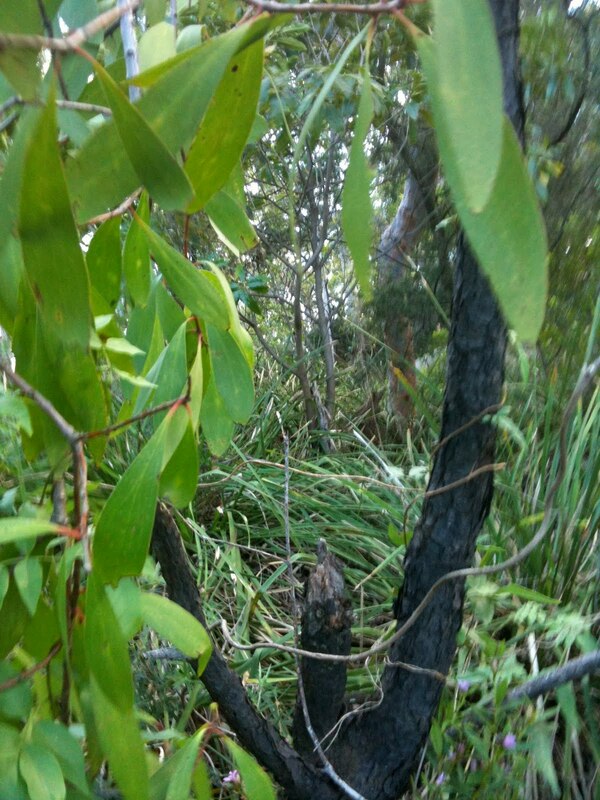 The next edible plant along the Gadyan track doesn't appear to be quite so appetising. 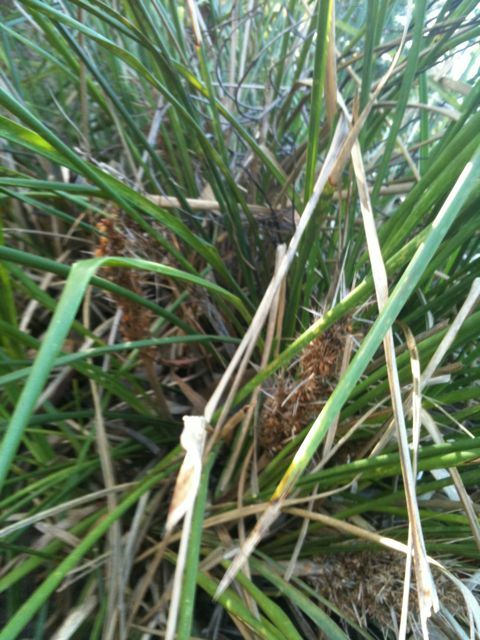 It's a distinctly inedible looking grass or rush plant called Lomandra longifolia. I don't really look at this and think, hmmm, must cook up a bit of that to go with my roo but I am willing to give it a go. You can eat the flowers (presumably before they dry up and dessicate like the ones above) as well as the 'succulent' leaf bases and you can also grind up the seeds to make damper - a traditional Australian soda bread prepared by swagmen and drovers when on their epic solitary journeys across the middle of this uncompromising continent. 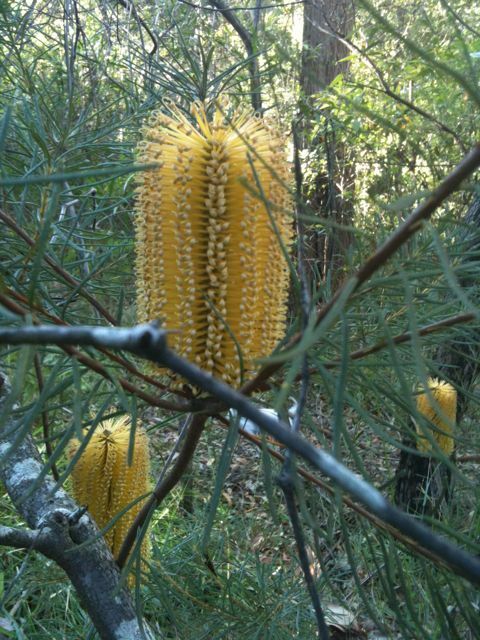 Once more I wasn't sure if this was exactly the right plant and, just in case it happened to be the one type of banksia that drops you dead with one sip of its juice, I passed it by without drinking from those jaunty yellow cups. So there we have it. Authentic Australian tucker to go with our kangaroo steak. I can't help thinking however that if Sniff and I had been walking the Gadyan track back in Cammeraygal times there would have been a fair chance that we would have ended up as that evening's steak ourselves with these plants serving as a couple of side dishes or as a bit of fancy garnish...Needless to say the reality is that the poor Cammeraygal of the North Shore are no more, entirely scattered, wiped out, disappeared. As early as 1860 it was recorded they were already rare visitors to their original homeland, many massacred or killed by diseases introduced by us, the colonisers. You may like to know that the Powerful Owl is out there hooting tonight accompanied by the clicking of a myriad of marsh frogs. I like to think that they are carefully watching over me until my banished boyfriend returns from distant climes. As a first-timer to your lovely stream of consciousness effusions, I now see why your musical compositions are so full of wit and wisdom. I am, was, and always will be yours devotedly. Don't talk to me about cheese - There are, I agree many very wonderful things about Amsterdam, but cheese isn't one of them. Despite a cheese shop on every corner stocked to the rafters with formula 1 tyre-sized cheeses, clog- and windmill-shaped cheeses in the tourist shops, cheese tours, cheese cruises, cheesy everything, it all tastes the same – of nothing! I am about to abandon Daniel to the cultural giddiness of Amsterdam and board a trans-European train myself – off to Bristol via the Thalys, the Eurostar, and The Great Western. I have my fur coat and my sobranes, though rumour has it you’re not allowed to smoke on trains now.